Henn Põlluaas and Helir-Valdor Seeder (left) and Siim Kallas (right). The parliament on Thursday elected Polluaas, who collected 55 votes, as the speaker of the Riigikogu. Social Democratic Party (SDE) member Sven Mikser, who also ran for the seat, received the votes of 45 MPs. 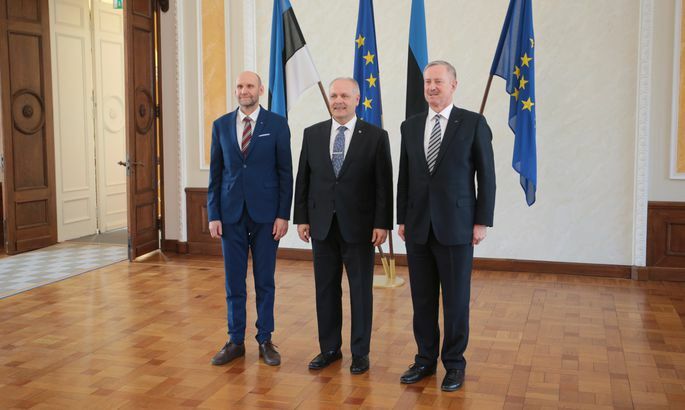 Parliament elected Isamaa leader Helir-Valdor Seeder as the parliament's first deputy speaker, while Reform Party member Siim Kallas was elected as the second deputy speaker of the Riigikogu. At the election, Seeder collected the votes of 55 MPs, while 44 MPs cast their vote in favor of Kallas. Altogether 100 MPs took part in the vote. The MPs of the Center Party, EKRE and Isamaa -- the three parties holding negotiations on forming a coalition government -- hold 57 seats in parliament. Isamaa member Mihhail Lotman is absent from the Riigikogu chamber on Thursday as he is scheduled to deliver a lecture to students in Tartu. Raimond Kaljulaid, representing the Center Party, has expressed opposition to involving EKRE in the coalition.